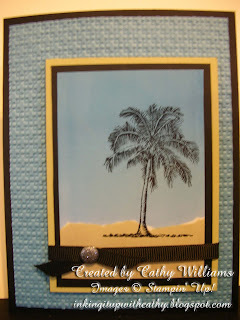 Our final card at my recent brayer class is this card which I CASE'd from Shannon West of Stampin' Up! She demonstrated this technique and I added a few of my own touches. This card is done best on Glossy Paper. To make this card, you need River Rock and Crumb Cake inks for the sand and Bashful Blue, Baja Breeze and Marina Mist inks for the sky. First, you take a post-it note and tear it down the center so you have some stickiness on both pieces. Place one side along the horizon line at the top. Ink up your brayer with River Rock and cover the bottom portion of your cardstock. Then ink up your brayer with the Crumb Cake and run it along the bottom 1/4" or so. Move up while rolling back and forth to get rid of the noticeable line. Remove the post-it note and take the opposite piece of post-it note and cover the sand portion of your cardstock. Ink your brayer with Bashful Blue and cover the entire top of the cardstock. Next ink your brayer with Baja Breeze and roll along the top half of the blue area. Again move up slightly as you roll back and forth to remove the line. Finally, ink in Marina Mist and run only at the very top and move down a little to get rid of the line. 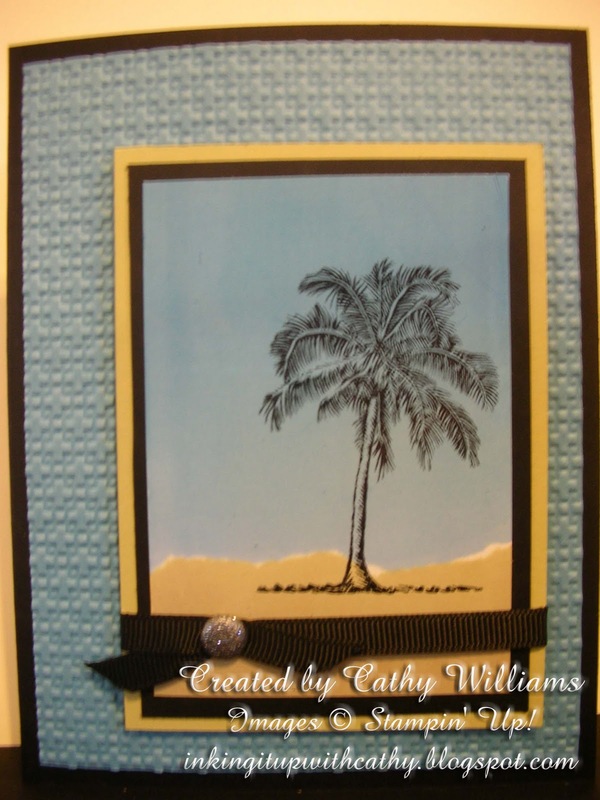 Remove the post-it note and stamp the palm tree from the Plant Hope stamp set with StazOn ink.